Coimbatore: Bumper-to-bumper traffic at Periyanaickenpalayam, the quaint thickly-populated suburb, would soon end. The national highways department has sent a proposal to the Union ministry of road transport to construct a flyover at Periyanaickenpalayam Junction on Mettupalayam Road. According to NH officials, more than 40,000 vehicles are using the stretch every day, making it one of the most congested roads in the city. The 1.72-km flyover would reduce congestion to a large extent. Vehicles headed for Mettupalayam and Ooty would take the bridge while local vehicles would use the existing road. According to sources, the NH conducted a study between Ramakrishna Mission Vidyalaya College and Jothipuram Junction and sent a proposal to the Union ministry of road transport. The flyover will start from the Ramakrishna Mission Vidyalaya College and end at the Jothipuram Junction. It will be a four-lane flyover. “We are not having any plan for land acquisition as it would take too much time for the construction of flyover. We have enough space in the stretch. Each lane will be 4.5-metre in width. The estimated cost of the project is Rs 85–Rs 92 crore,” said a senior official. He said Periyanaickenpalayam is one of the important junctions on Mettupalayam Road. It has many cut roads. Many motorists entering the Mettupalayam Main Road from cut roads often meet with accidents. Fatal accidents were also reported in the stretch. After the construction of the flyover, the rate of fatal accidents is expected to come down in the area. The national highways department has been trying to construct the flyover since 2016. It then roped in a private company to design the flyover. So far, two companies were roped in by the NH and both the companies had failed to prepare the designs of the flyover. Now, the department has given the task to a third company, which would complete the design work soon. “We have sent the proposal for the flyover a few months ago and sought funds from the ministry of road transport. After the sanctioning of the fund, we would start the tender work,” said the senior officer. The national highways department is also planning to expand Jothipuram Junction- Mathampalayam stretch on Mettupalayam Road into a four-lane. The total length of the stretch is 5.5 km. From Gas Company near Narasimmanaickenpalayam to Ramakrishna Mission Vidyalaya Educational institution will also be turned into a four-lane. The length of this stretch is 600 metres. “For the four-lane expansion work, we have to cut 530 trees in the above two stretches. We have approached the revenue department to get permission to cut the trees,” said the officer. 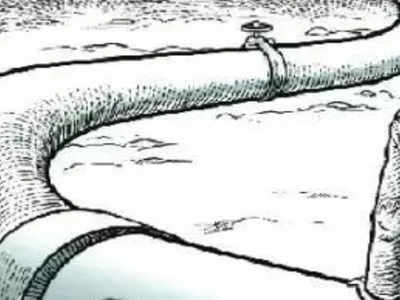 Coimbatore: The Tamil Nadu Water Supply and Drainage (TWAD) Board is all set to implement the underground drainage project (UDG) in all the 11 newly-added areas of the city . To start with, TWAD officials would implement the project in 14 wards of Kurichi and Kunniymathur areas. “Tender to lay sewer lines and construct manholes in these two areas was floated and work on the project, the cost of which is pegged at Rs 577.77 crore, is likely to commence within 15 days,” said a TWAD official. The project, which will be funded by the Asian Development Bank, is designed in a way to meet the requirement of population in these areas in 2035, which is expected to be more than 3.41 lakh. “Under the project, sewage connections will be provided to 69,600 households. In total, sewage pipelines will be laid for 439km. As many as 17,754 manholes, 11 main sewage pump stations and 10 sub-stations will be constructed in this phase,” the official said. Presently, sewage from these areas is let out in the open. Once the project is implemented, sewage could be properly collected and disposed using the latest technology, the official said. The project is expected to be completed within three years from the date of commencement. A separate sewage treatment plant with a capacity of 300MLD (million litres per day) will be set up to treat sewage from Kurichi and Kunniymathur areas and the treated effluent will be discharged into the Noyyal river, the official said. He hinted that the sewage treatment plant will be set up at Vellalore dump yard, which is 2km away from Kurichi and Kunniymathur. “A separate tender will be floated to construct the sewage treatment plant at the dump yard at the earliest,” the official said. COIMBATORE: Land acquisition process for laying pipelines under the Pillur III water supply scheme is likely to commence soon. To lay pipelines for a distance of 30km from the Bhavani to Pannimadai on the outskirts of the city, Tamil Nadu Water Supply and Drainage (TWAD) Board has already identified a total of 162 acres land. Out of this, 125 acres land are owned by 411 individuals in nine panchayats, including Kurudampalayam, Panimadai, Gudalur south and Thekkampatti. The remaining 37 acres are owned by the government. The Pillur III water supply scheme would bring to the city an additional 178 million litre of water per day, the officer said. Though the project is mainly proposed to improve the water supply in the added areas, water from the project would also be used for 24x7 water supply scheme in old corporation limits as water from Pannimadi would be distributed to several areas, including Bharathi park. The project cost is pegged at Rs 750 crore and it will be funded by the Asian Development Bank. Coimbatore: The barren Chennamalai hillock in Sirumugai forest range would soon come alive with greenery, thanks to the tree planting programme of the forest department. Under the programme, the department has decided to plant around 25,000 saplings on the hillock and the surrounding areas. Officials from the Sirumugai range said the project was sanctioned last February and they had been raising the saplings in a nursery at the range. The Chennamalai hillock and surrounding areas are home to deer population. The department would erect tree guards, a net-like structure, to protect the saplings from being eaten, said Manoharan. “The trees will be fed by monsoon rain. In January and February, we will provide irrigation for the saplings,” he said. Under the programme, the forest department will plant 7 lakh saplings across the state, said officials. Saplings will be planted not only in forest ranges, but in institutions like schools and colleges. From this year, the department has decided to carry out reforestation programmes in degraded forest areas to bring them back to life. COIMBATORE: It has been more than two years since the city corporation has taken any step to remove encroachments from the open space reservation (OSR) site at T Nagar at Ramanathapuram in the city. 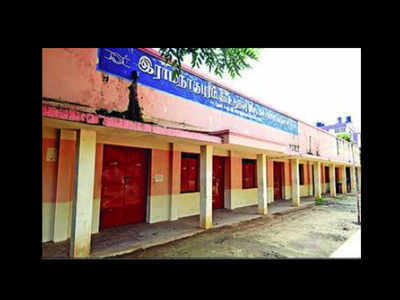 After residents took to streets in 2016 saying Ramanathapuram Cooperative House Building Society had grabbed a major portion of more than 20 cents land, which was earmarked as OSR site, to construct a complex, the civic body had sealed all the rooms, but only to remove the same days later. “The society has occupied a major portion of land and only a few cents are set aside for playground,” city-based activist S P Thiyagarajan said. While their neighbours at BR Nagar have a park to socialize or take leisurely walks, Ramanathapuram residents have to depend on roads to take a walk. “The situation is same with more than 75% of OSR sites in the city limits. They all remain abandoned and do not meet their original purpose,” Thiyagarajan said. According to the Tamil Nadu Town and Country Planning Act, layouts having more than 65 cents should have 10% of its land as OSR site. The basic idea is to provide some open space for recreational activities without having to travel longer, as it is difficult to find space in the congested city, said V Mahendran, of Alamu Nagar Residents Welfare Association, who had managed to remove encroachments from 50 cents of OSR site recently. “Without this space, the most affected would be children and elderly people. As they can’t travel long distances on regular basis, they would be forced to stay indoors on most days,” he said. After the Madras high court pronounced a judgement in 2007 in favour of the city corporation, then corporation commissioner had directed officials to protect and maintain the reserved sites. The judgement said “the OSR land reserved for public purpose in a layout or in the development plan or master plan approved by the local body cannot be used for any other purpose than the specified purpose”. When contacted, a town planning official said they have started work on identifying and protecting reserved sites in all the zones. “We have started to fence the identified reserved sites in west zone. Soon, it would be extended to all zones,” the official said. Coimbatore: From October 15, those who plan to construct a building need not visit the corporation office for plan approval. As part of its efforts to enhance citizen-centric services through responsive and transparent e-Governance systems, the municipal administration department plans to update the automated software for plan approval. Once the system is in place, denizens will be able to upload the plan from the comfort of their home and get the approval. Fee for the service can be paid online. “Even though there is an online system for plan approval, officials are uploading the required documents instead of the applicants,” a recent circular from commissioner of municipal administration G Prakash said. “After the software is updated and the process is fully automated, building approval should be issued only through online with the digital signature of the officials concerned,” the circular added. Licensed building surveyors will be trained in using the updated software to create more awareness about it. All applicants have to pay a scrutiny fee of Rs 500 while uploading the documents, whether they reside in corporation, municipality or panchayat. While the Coimbatore corporation uses a software called Auto- DCR, rest of the districts have a software called E-DCR. The change will be implemnted in both the software. Welcoming the changes, members of the Association of Licensed Building Surveyors said that such an update will make the existing software more user-friendly. “But the Coimbatore corporation was not collecting scrutiny fee,” S Kanagasundaram with the association told TOI. “At present, builders submit the required documents, including proof of ownership and land patta, at the corporation office and once the documents are processed through the software, the printout is submitted manually to the assistant town planning officer concerned. Ideally, the entire process should take not more than 30 days from the day the plan is submitted. But, it takes up to three months now. The approval is sent through registered post to the applicant,” he said. “Once the process is made completely online, applicants will be able to check the status on the website itself. Now, unless the applicant visits the corporation office, errors in the application or missing documents are not notified,” Kanagasundaram added. Coimbatore: DMK MLA N Karthik on Monday petitioned corporation commissioner K Vijayakarthikeyan demanding the civic body to desilt both the Noyyal and Sanganur rivers ahead of the monsoon. After meeting the corporation commissioner, Karthik said he has insisted the commissioner to ask the public works department officials to desilt Noyyal and Sanganur rivers to avoid rainwater from entering houses adjacent to the river. He has also given a list of drainages in the city that have to be cleaned ahead of the monsoon season. He alleged that the corporation has been charging more for replacing drinking water pipelines in ward 41. “The corporation has been laying new pipelines at Cheran Ma Nagar. The corporation has been charging the residents for laying these new pipelines. We have insisted them to charge less as the residents could not afford it,” he said. He also demanded to set up underground drainage system in Hutco Colony at Sowripalayam as the houses in the area were constructed around 40 years ago. Coimbatore: The city corporation commissioner has directed officials to speed up all the schemes that are being carried out under the smart city project. During a review meeting conducted with the officials on Thursday, commissioner K Vijayakarthikeyan directed them to ensure that the projects are executed within the timeline and fund. “Working status of all the projects were reviewed,” said an official, who attended it. The commissioner later inspected houses in ward 50 and pasted stickers in front of the houses that were free of mosquito breeding sources, in an effort to appreciation the residents’ efforts. The civic body has given about 1,000 stickers to the sanitary workers, who will check houses for sources of breeding mosquito. Apart from houses, the workers will also check abandoned houses, sumps, cement tanks used for storing water, sunshades and other vulnerable places, empty plastic containers, coconut shells and tyres, and destroy mosquito larvae. Many residents have shifted to the houses of their friends and relatives and to the relief camps set up by the civic bodies. TIRUPUR: Continuous rainfall has caused water logging in the city, flooding more than 500 houses. Many residents have shifted to the houses of their friends and relatives and to the relief camps set up by the civic bodies. Areas like Perichipalayam, Therku Thottam and Thiruvika Nagar in the city were the most affected due to water logging. Water has entered most of the houses, knitwear units and shops. Local residents blamed poor drainage system for the situation. Tirupur corporation took steps to drain water in those areas and also arranged accommodation and food at a convention centre for the residents. Collector KS Palanisamy inspected the affected areas on Monday. Avinashi taluk has received the most rainfall in the district. Many of its surrounding villages were affected due to floods. Residents in Chinthamanipalayam in Pappangulam panchayat were asked to shift to a government school after their houses were flooded. Traffic through Gobichettipalayam Road was stopped at Valayapalayam after it got flooded. Coimbatore: The city corporation on Monday commenced work to locate the existing underground water pipelines at RS Puram, where the 24/7 potable water supply project would be implemented on a pilot basis. “The French firm implementing the project, Suez Projects Pvt Ltd, has started to dig trial pits to identify and locate the actual ground position of pipelines. Trial pits would be dug on almost all the streets and at junctions,” said a civic body official, who hinted that more than 40 such pits would be dug. After locating the pipelines, the firm would submit cost estimation for implementing the project at RS Puram. It has already completed all the surveys - consumer survey, topography survey, GIS survey and network survey – required for the project. “The project will be implemented in all the three zones of RS Puram. The actual work on the project is expected to commence in December,” the official, who didn’t want to be named, said. There are 6,600 water connections in the area and they would be categorized into two district metered areas. Water flowing through these areas would be metered and flows would be analyzed periodically, the official said. The project, which was the last to be sanctioned under the Jawaharlal Nehru National Urban Renewal Mission (JNNURN), would be implemented at a cost of Rs 2,961 crore. The contract was given to the French firm for a period of 26 years – one year for study, four years for implementation and 21 years for maintenance. The firm has completed consumer survey in nine months of its study period. Corporation commissioner K Vijayakarthikeyan, meanwhile, reviewed the progress of the project on Monday. He has directed officials to ensure the presence of sufficient amount of chlorine in potable water provided to public to prevent waterborne diseases during monsoon season. 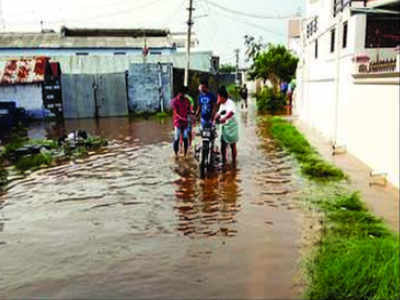 COIMBATORE: Residents of Maruta Nagar at Edayarpalayam here on Wednesday petitioned city corporation commissioner K Vijayakarthikeyan, urging him to take necessary steps to stop the work to link sewer line connection from a nearby apartment to the stormwater drain in their locality. Pointing out that the stormwater drain in their region also doubles as sewer lines in the absence of a proper drainage system, members of Maruta Nagar welfare association said overflowing sewage water was a common sight in their locality, especially during the monsoon season. “Whenever it overflows, the region would turn into a breeding ground for mosquitoes, causing health problems to the public,” they said. There are more than 100 houses in the locality. A couple of weeks ago, incharge of a private apartment that is located just 300 meters away from the locality, started to cut roads at four places to lay a pipeline to carry the sewage from the apartment to the stormwater drain, the members said. If the sewage from the apartment were to let into the drain, it would overflow almost every other day, posing serious health hazard, they said. When contacted, a corporation official said they have issued directions to stop the work immediately. Tirupur: Residents have flayed the city corporation for increasing the property tax manifold without properly assessing their properties. In several cases, the revised tax was higher than even the guideline value on the properties, residents said. Political parties, including the ruling party, are demanding a rollback. As many as 22,9718 buildings, including houses and commercial establishments, are under property tax assessment in the city. “The corporation has reassessed and revised property tax on about 19,000 buildings. Without assessing the properties properly, they have revised the taxes even up by 20,000%,” CPI district secretary M Ravi said. “For instance, K Nataraj of BSS Road, who owns a house on a 522sqft land, was asked to pay Rs 542 as property tax in 2016-17. But a notice from the corporation dated October 3 asked him to pay Rs 35,663 andRs 70,874 for 2017-18 and 2018-19 respectively. The man, a retired spinning mill labourer, is now forced to pay Rs 1.06 lakh, which is even higher than the guideline value of the property,” he said. “We have so far come across at least 50 such cases. The corporation has started to send such notices with revised tax rates. It earlier pretended that it dropped the move to collect the revised taxes after opposition parties staged protests,” Ravi said. TIRUPUR: Farmers from Pongalur region in Tirupur district have demanded the state government to bring water from the Noyyal river to the Uppukarai stream following the inadequate supply from the Parambikulam Aliyar Project (PAP) scheme. “When water was supplied from the PAP scheme to three zones, there was enough water to agricultural lands in Pongalur region and farmers cultivated two crops yearly. But after the scheme was extended to additional areas, the water share to the region has reduced,” said K Thangavelu, a farmer from Pongalur. Presently, the PAP scheme serves around 4 lakh acres. The Uppukarai stream, originating on Alagumalai hill near Pongalur, runs through Uppukaraiyampalayam, Kulathupalayam, Karungalipalayam, Periyariyapatti, Padiyur, Rasappalayam, and Karakkattupudur before draining into the Noyyal. “If the water could be brought from the Noyyal to the Uppukarai stream, it will at least help to recharge groundwater and supply potable water. 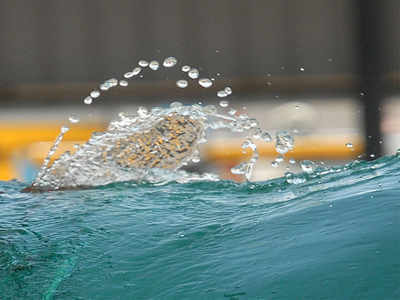 The pipeline could be installed at Somanur and water could be taken during rainy season,” he said. Farmers said it will cost only a few crores to implement the project. “The government should take immediate steps to implement it,” they said. They already presented the idea to the public works department. Coimbatore: About 15 residents from Chemmani Chettipalayam, a village in Annur block, on Monday said that a waterway that drains excess water from the village has been encroached upon and blocked. They appealed to the collector to get the encroachment removed. The flood alert issued a week ago had led to identification of many such encroached and blocked waterways. Among the many such waterways identified by farmers’ associations and villagers, the one at Chemmani Chettipalayam drains water into a man-made lake a few kilometres away. “The local body had cleaned the drain at a cost of Rs 2 lakh,” said Aravindan, a petitioner. The residents said that the waterway has been blocked by the owner of a land adjoining it. “The person has filled a portion of the waterway with mud, thus blocking the flow of water. Because of it, even during a mild rain, water comes into our houses and residential areas, causing a lot of hardship to senior citizens and children,” the petition said. “The water also carries poisonous snakes and lizards into our homes. It is contaminated with sewage and not only causes stink but also poses the risk of a disease outbreak,” stated the petition. A farmers’ association had last week petitioned the collector about another waterway that carries excess water from a lake in Idigarai to one in Annur being blocked by an encroacher. The blocked drains pose a risk of flooding and destruction of small villages, the petitioners said. Udhagamandalam: In just a week’s time, Ooty had generated about 3.2 tonnes of waste pet bottles because of the mindless act of tourists. The pet bottles were collected from the Kodappamund channel which is running through the heart of the town. The channel is meant for channelling stream water from the Kodappamund area all the way to Ooty Lake. The channel was cleaned and silted a week ago in the wake of red alert issued by the IMD. But to the surprise of the district administration, the channel was found overflowing at two or three points. On an inspection on Monday, it was found that the channel was blocked with loads of pet bottles. The recent rain had brought all the litter into the channel. In the wake of generation of shockingly enormous quantity of pet bottles and keeping in mind the ecology of the hill district, the Nilgiris district administration has proposed to have a check point for plastic bottles at Kallar Junction and other seven check posts in the district. “It is very shocking to notice the Kodappamund channel being accumulated with huge quantity of waste pet bottles. It is because of littering on the roadsides mainly by tourists. The recent rain had washed away the bottles littered into the channel,” Nilgiris collector J Innocent Divya told TOI. “In a positive note, a message of responsible tourism will be delivered by checking the tourists’ vehicles at Kallar Junction and other seven check-posts which are the portals to the Nilgiris. Hence, we have proposed a plan of deputing eight teams involving police and revenue officials at eight check-posts. Tourists have to leave the plastic pet bottles and other plastic items at the check-posts,” Divya said. Five water ATMs will be installed in association with BPCL in the town to minimize pet bottle wastage. “Littering of any plastic, including pet bottles, in Ooty will attract fine,” she said.